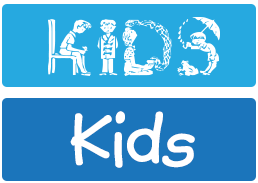 Resist the temptation to use cutesy, gimmicky, and/or illustrative fonts (such as Kiddo, shown in upper example) that may tie in to the subject but are hard to read. Select simpler letterforms (such as Kidprint, shown in lower example) that are more legible, but still evoke the spirit of the subject. Use colors with high contrast to maximize readability. Combining symbols with type (right) rather than using type alone can help emphasize your message, especially if it will be seen by viewers in motion (walking or driving). Avoid placing type on a busy background (upper), which can make the type difficult to read. For better readability and quicker recognition, separate type and image (lower). Signage constitutes a small but highly-visible category of typographic design. Sometimes also referred to as environmental graphics, signage includes: billboards and banners, trade show booths and transit posters, retail and real estate signage, window lettering, magnetic placards, and sometimes even logos. Selecting appropriate typefaces – and using them appropriately – is critical to the effectiveness of any signage project. How much time does the audience have to view and read the sign? Signage can be static, walk-by or drive-by, and this should influence the typeface choices and treatments you use. To design effectively, you also need to know the materials and fabrication methods to be used. Their characteristics and limitations affect how the type will behave in its final form (e.g., thin strokes might appear thicker or even thinner depending on how they are produced). Use highly contrasting colors for optimum readability and instant recognition. Last but not least, try to test your signage under actual conditions in terms of size, lighting, distance and any other viewer variables – before you commit to the final print or production scenario. Check to make sure that your signage complies with the Americans with Disabilities Act (ADA) if required or desired.